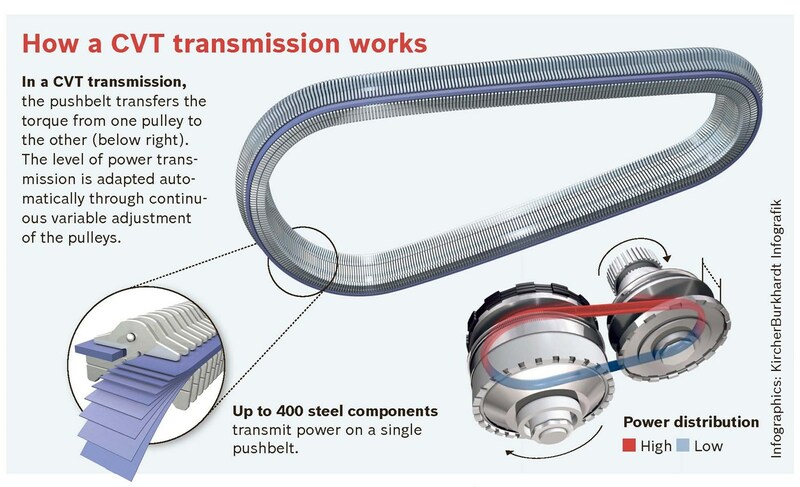 What is a CVT (continuously variable transmission)? Do I need one in my car? Main image caption What is a CVT (continuously variable transmission)? A continuously variable transmission (CVT) is a simple alternative to an automatic gearbox. Firstly, how does a gearbox work? A gearbox allows the wheels to rotate at various speeds (in mph), without altering the engine speed (in rpm). To simplify that, imagine two gears connected by a chain, as you would on have a bicycle. The gear connected to the pedals is half the size of the one at the rear wheel. For every full rotation of the pedals, the wheel would rotate half a turn. You would travel slowly, but the pedals would be easy to move. Swap that around so that the pedal gear is now double the size of the wheel gear. For every full turn of the pedals, the rear wheel would turn twice. It would be really hard to set off, but once moving you could achieve high speed. That's exactly how it works in a car. A conventional manual gearbox will have five or six gear ratios, with the lower set useful for low speed - pulling away from junctions or climbing hills - and the higher ones for cruising on the motorway at low engine rpm. Normal automatic gearboxes work in largely the same way, except the job of depressing the clutch and swapping the ratios around is taken care of by the car. So...how does a CVT work? 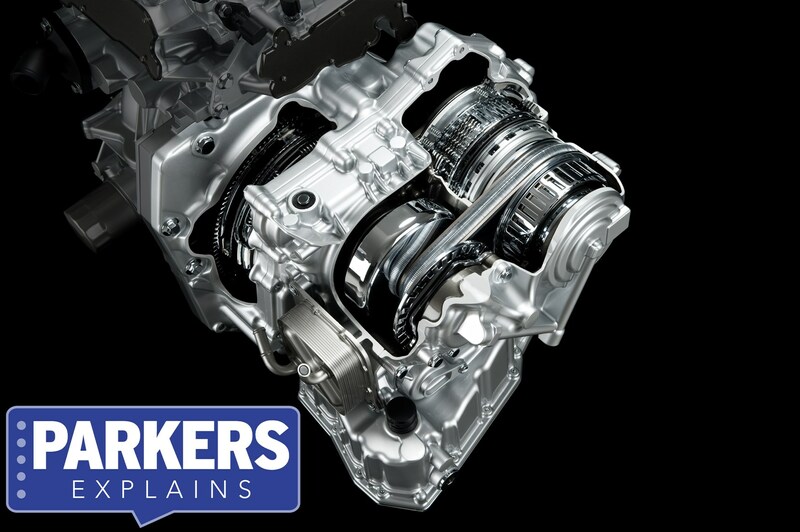 A continuously variable transmission also works automatically to alter the speed of the wheels in relation to the engine, but instead of using a box full of gears, it utilises a pair of pulleys - which is why it is refered to as a transmission, rather than a gearbox. One is connected to the engine (the drive pulley) and another to the wheels (the driven pulley) by a special belt, much like the bicycle in our example above. However, unlike the fixed metal gears of a bike, each pulley of the CVT is able to vary its radius in order to alter gearing, because the pulley is actually a set of cones than can move together or apart. Exactly as in the previous analogy, when the drive pulley (engine-side) is larger than the driven pulley (wheel-side), the result is a high gear. When the drive pulley is smaller than the driven pulley, it yields a low gear. More often than not you won't have a choice - cars that come with an automatic gearbox will either have a conventional torque converter, a more modern dual-clutch 'box, or a CVT. So what are the benefits? Well, a simpler construction and fewer parts means a CVT is often smaller and lighter than any other type of auto transmission. Most importantly though, unlike metal gears of a fixed size, the pulleys can vary their size millimetrically so a CVT can offer a huge number of gear ratios, rather than being restricted to just five or six. This makes accelerating feel much smoother as there are no solid gears meshing together. It also means the engine can be held at its most economical point while increasing the speed of the wheels, where a normal gearbox would have to speed up from 2,000- to 5,000rpm over and over. For that reason you often see CVTs on hybrid cars like the Toyota Prius, and smaller hatchbacks such as the Honda Jazz. What is a CVT (continuously variable transmission)? What is a CVT (continuously variable transmission)?